North Carolina’s institutions of higher education deliver a solid return on investment for their students and the state. 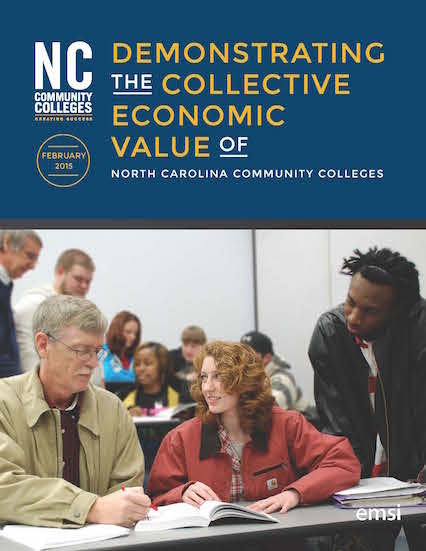 The North Carolina Community College System, University of North Carolina system, and the 36 independent colleges and universities in the state, together created $63.5 billion in added economic value during fiscal year 2012-13, according to a study conducted by Economic Modeling Specialists International (EMSI). The state’s community colleges are often cited for the cost savings they offer students and families, and the impact of these lower-cost educational and skill development programs are evident in the impact on alumni wages outlined in the study. Today, 40 percent of North Carolina wage earners have received education or training at a North Carolina community college during the last 10 years. The accumulated contribution of former students totaled $19.6 billion in added state income, according to the study, which is equivalent to creating more than 322,000 new jobs.